If you’re stuck with a big event and you haven’t planned the meal yet, don’t worry. 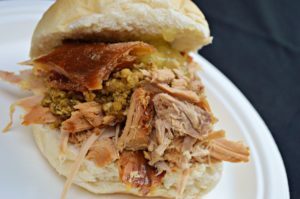 Hog Roast Cumnock have got you covered for the food lovers in your life. Our client, Lauren, had the task of organising the food aspect for a huge event for her friends and family. She questioned who she could trust with delivering locally sourced meat, packed with flavour? But most importantly, who could offer a bespoke catering service and deliver a great experience? That’s when she immediately thought of Hog Roast Cumnock. And she wasn’t disappointed. Fast forward to a beautiful, crisp day in November where her friends and family were gathered together, and patiently waiting for the most anticipated food event of the day. What better way to wet your appetite than the aroma of slowly roasting hog? In no time, the food was served with various vegetables, side dishes and of course, the hog roasted pork. The meat was succulent, tender and cooked to perfection. She was also worried about her vegetarian family and friends but Hog Roast Cumnock had her covered with our veggie skewers and various side dishes that are 100% fresh, colourful and a perfect alternative if you’re not a meat lover. We had the food covered, and even the cutlery, plates, chefs and waiting staff, which made Lauren’s experience and all of her guests experience completely care free. Lauren was impressed by our professionalism, which she said really reflected in the quality and presentation of the food they were served, she had no doubt that we had everything under control, so she was free to mingle with guests and enjoy the event before settling down for a wonderfully delicious meal. Catering For A Very Special 80th Birthday Celebration! A Spring Celebration Hog Roast in Coatbridge.